I had been skeptical of this scandal. I had been skeptical of the existence of the video, I had been skeptical that anyone could be dumb enough to get elected mayor, hang out with drug dealers at a crack house and smoke crack in a drunken stupor, and (here's the real kicker to me) be filmed doing it. I hope you excuse my skepticism. This scandal is completely invraisemblable. That's the only word I can think of. It doesn't have the ring of truth to it. I mean if there was a headline that Stephen Harper was caught partying in a brothel, even if you did have the evidence, it would be hard to believe, given his straight-laced persona. It's the same thing with Rob Ford. Sure he had substance abuse issues, but smoking crack at a crackhouse? That's just in an altogether different category than being a functional alcoholic. I did not want to say anything until I saw the video. How many times I wanted to comment on a scandal (not just this one) and the Holy Spirit gave me the good idea to just say nothing until all the facts were on the table. My reserve has served me well. Now that Ford has admitted to smoking crack, I think it's time to step aside. There are many Ford supporters who want him to stay. The joke goes: Rob Ford does a better job on crack than David Miller does sober. That's a funny joke, but it's no basis for running a city. Some people want him to stay because of his accomplishments. The problem is that while Ford may have done good things, as an alcoholic, he's a ticking time bomb. The guy was dumb enough to get drunk, hang out with some shady characters, smoke crack and allow himself to be filmed doing it. What's going to happen the next time he gets into a drunken stupor? We can envision all kinds of scenarios where he might make decisions as mayor in a drunken stupor. I can hear some people object: As long as he keeps his stuff private, who cares? We have this strange idea that human beings divide themselves perfectly into public and private. And that these public and private halves have nothing to do with one another, that you can be a complete jerk in private, but perfectly competent and respectable in public, with no fallout. Human beings don't work that way. Your character and decision-making in private will spill over in your public life. If you have bad decision-making skills in private, they will not be any better in public. If you drink to excess in private to the point of compromising your own political career, your decision-making as a politician is seriously compromised. If you don't care enough to forego the bottle for your own self, how can we expect you to work for the good of others. 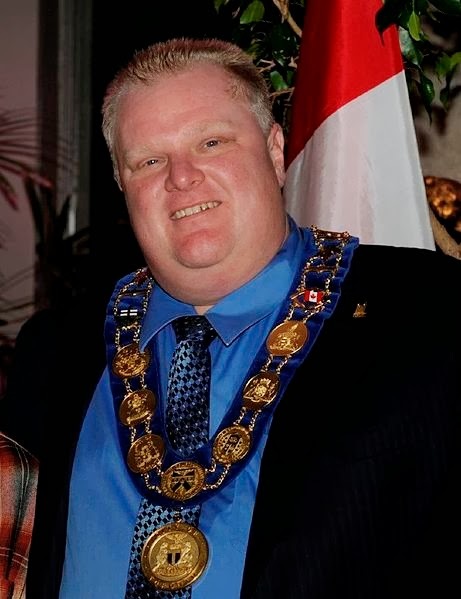 There is part of me that would like to see Rob Ford stay and poke the left in the eye. And I'm certain I'm not the only one. But the purpose of politics is not these right-left games. It's to run a government efficiently. And Rob Ford has been lucky, so far, but for long? How long will he keep a lid on his drinking? And if this is not enough to convince you to call for his resignation, then consider what he will do to the Conservative brand in Toronto if he remains and commits the same mistakes-- because he will. That's what alcoholics are like. Right-wingers are not doing their movement any favours by supporting this guy. I'd be sorry to see him go. I like him. But we can't have a guy who smokes crack as mayor. Point.